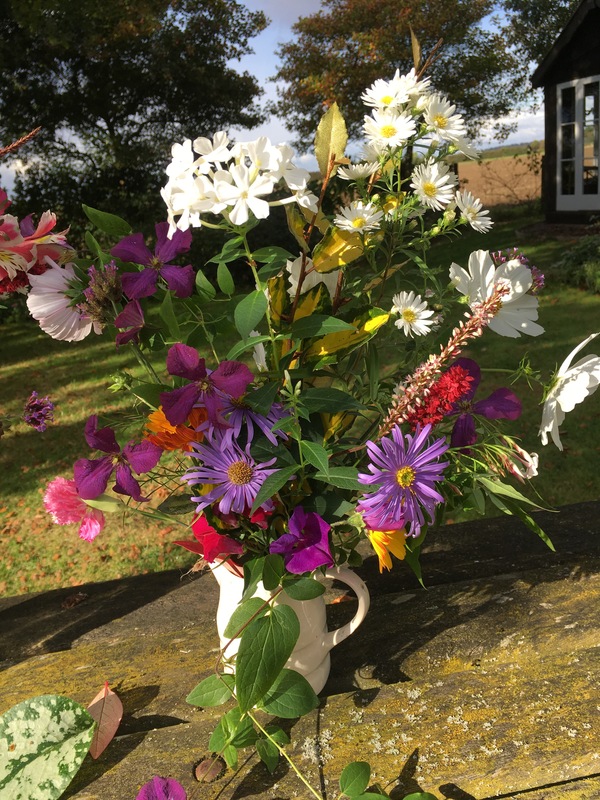 For the past two years, I’ve run round my garden on a Sunday and created a posy of “everything in flower” for my mother-in-law, Joan. Sadly, she can’t visit us as often as she would like. My father-in-law no longer drives, and they are both in their late eighties. So I try to create a series of mini- posies, one with scent, another with foliage. It’s a flavour of the garden that I’m after. They are simply tied with string and not arranged. Joan takes great delight in studying each stem and making her own creations. It’s my way of sharing my garden with my in laws. Keeping the dialogue going and asking advice. It’s become a kind of tradition. One I am happy to have started. Blue Aster Monch, Clematis Polish Spirit, Persicaria, white Cosmos Purity and white Aster Monte Casino. Sweet pea High Scent, well named- and reliable. Blue Aster Monch, Diascia rigescens, and Antirrhinum Black Prince. I’m sowing more sweet peas this week. Heritage varieties from Easton Walled Garden, historic renovation project near Grantham, Lincs. Verbena Bonariensis seeds itself around the cut flower patch and provides pickings from May to November. Alstroemeria flowers all year round in a cold poly tunnel. Gardening and growing flowers- such simple pleasures- much better when they are shared with someone. Thank you to Cathy at Rambling in the Garden for hosting In a Vase on Monday. ← Wordless Wednesday. The hedgerow 5th October. thank you Sunith. Thanks for your kind comments. 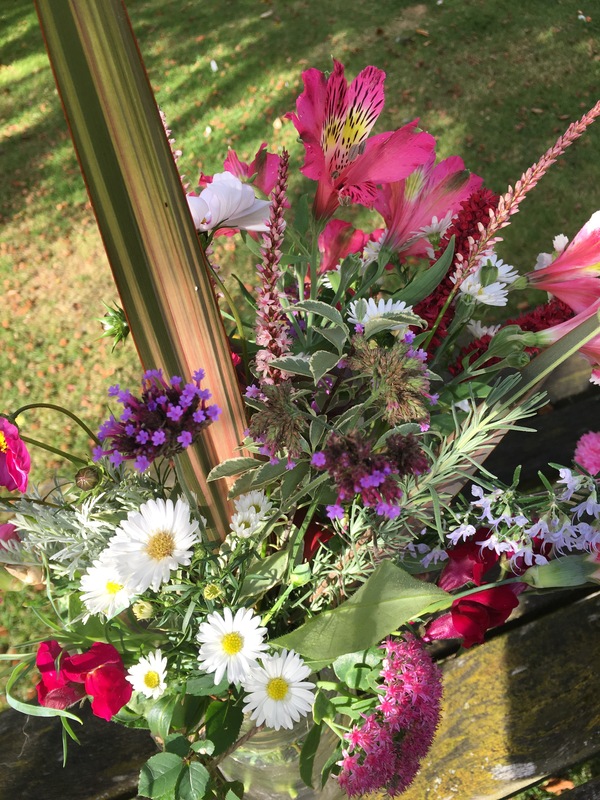 I am no flower arranger, which has been confirmed by my brief appearances in the Monday Vase meme, but I do enjoy looking at the lovely creations from fellow gardeners. I particularly enjoy looking at the range of flowers which are gleaned from gardens throughout the year which inspires me to try new plants. Yes, agreed. I’ve got lots of new ideas from the blogs. It’s great to see how other people use plants and materials. And what they can grow-all around the world. Amazed how many of us are growing the same thing, although we live thousands of miles apart. Beautiful flowers and lovely sentiment. Also really enjoyed your hedgerow post. That’s a smart looking potting shed you have, Karen – well, it’s a nice window so I am guessing the rest of it is pretty OK too! Yes, a lovely tradition, and I like what you said about Joan studying them and making her own creations – such a worthwhile experience for all of you. One of the triggers for the meme was the fact that my Mum (now 90) always puts a little posy of flowers in her guest bedroom when there are visitors due – she loves flowers, but these little vases are the only ‘gardening’ she does now. Which persicaria have you used? And has Polish Spirit flowered right the way through the summer? I will be looking for two clematis for those new obelisks of mine. Alstoemeria all year round – lucky you 🙂 Lots to take in from your first IAVOM and hopefully you will be back next week – thanks for joining us today! thanks for your lovely comments, Cathy. My husband built the shed and the best thing in there is a massive table where I can spread out all my seeds and cuttings and have space to work. Most importantly- there’s a radio and a kettle. Must have comfort while we work 🙂 I still put a little posy of flowers in all the bedrooms- and the bathrooms come to think of it. Only in a small jam jar. I love to bring the outdoors in. I’m definitely happiest outside- and would move into that potting shed if I could! Thanks again for the welcome. I’m enjoying joining in. Forgot to say, clematis Polish Spirit flowers late from August to November here. Sometimes even a few flowers at Christmas. It’s on a very shady north wall, so might be earlier flowering in a more sunny spot. Totally reliable and I can recommend. Will have to look for the labels for the persicaria. The alstroemeria is grown in huge pots as its such a thug in the garden. But this way, it does flower right the way through the year. What a lovely (and thoughtful) tradition! Your mother in law must really look forward to her weekly posies. What a fabulous idea Karen. What a sweet tradition and I expect it brings them great cheer all week long. Your flowers are beautiful! Thank you for your kind comments Eliza. Much appreciated. 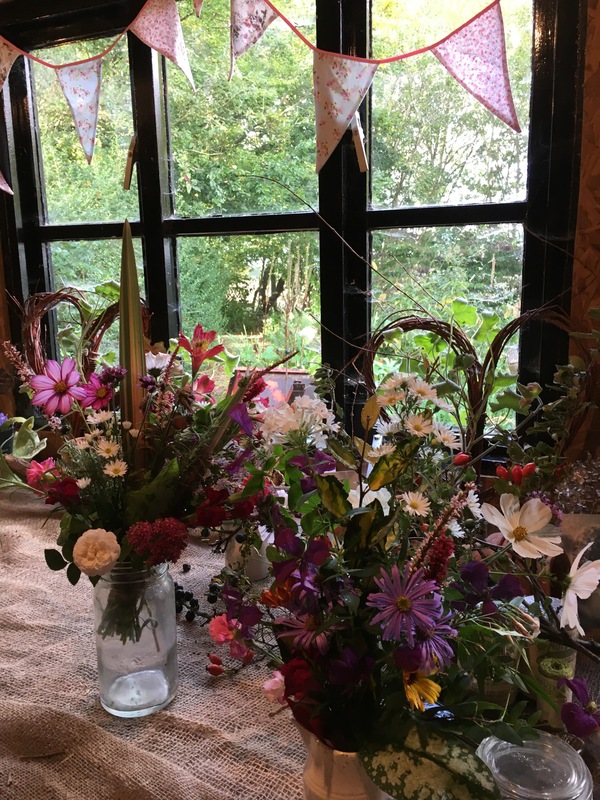 The glimpse of your potting shed with its beautiful arrangements suggests a creative florist’s workbench to me. Mine is much neglected of late, full of spiders lurking in dusty pots. You’ve inspired me to do a bit of housekeeping! 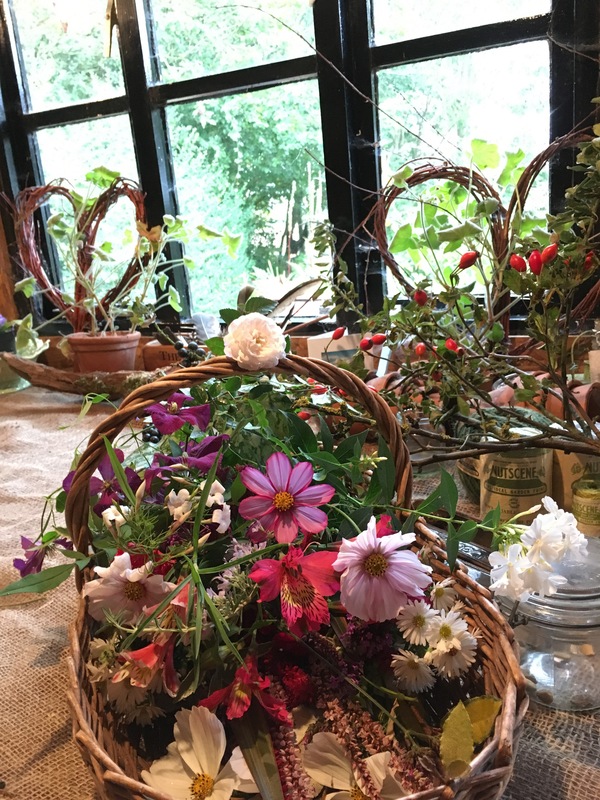 These are all really pretty creations and it is lovely that you can share your garden with your MIL in this way; mine reads my blog to keep in touch with what I’m doing plus I was inspired by her to start flower arranging, I’d never really done it before I saw what she could do. Are you sure your Aster is Monte Cassino, the flowers look very large? thank you Christina. My MIL has been a great inspiration to me. I’ve learned such a lot from her. She taught me how to make curtains- and brought me a sewing machine as a wedding present. She does the flowers for chapel as well. I’ve always noticed how she manages to make something out of nothing really. Thanks for your kind comments. Lovely post. Looking at the flower pots is such a delight. I am sure your -in laws must be happy to have you in their life. Thank you, I am so lucky to have them in my life. They have been like a second set of parents to me. Always so supportive. Have a lovely day. Thanks for your comments. Beautiful flowers Karen. And I love the photos in your potting shed – I am quite envious of that little space you have for ‘pottering’! That white aster is particularly striking. I love your way of sharing your garden with your family, such a great idea. I too clocked the rather handsome potting shed, how marvellous. I am interested you’d clematis copes with the north facing position, I may need to try it when I get round to planting my new raised beds. How wonderfully thoughtful of you!! 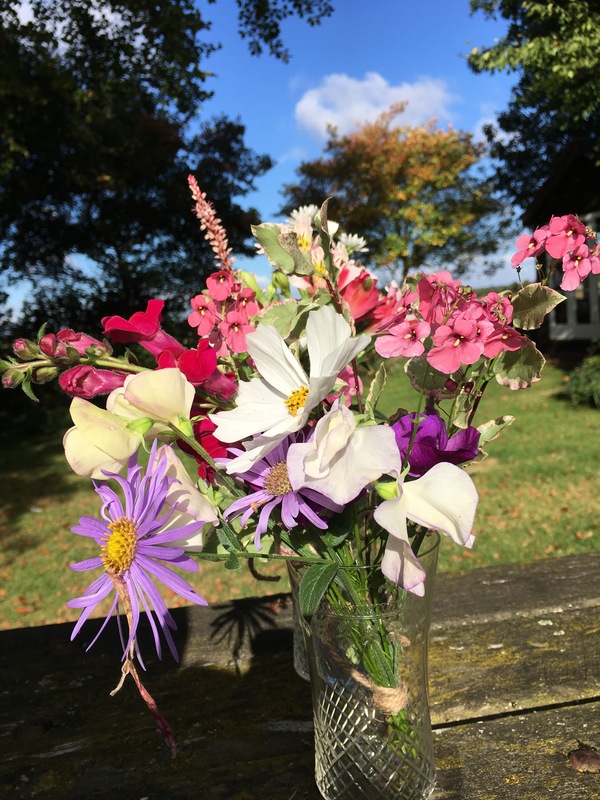 … the weekly flowers chosen from your garden is one thing, but to prepare them for your MIL knowing that she would love to arrange them herself is a lovely gift! Lovely to the eyes and to the heart! Beautiful flower arrangements and I love the tradition you started. So sweet!